Never heard of St. Clement? He was a bishop in St. Peter and St. Paul’s days. Let’s read his work together. Chances are you’ve heard of St. Augustine even if you’ve never read anything by him. 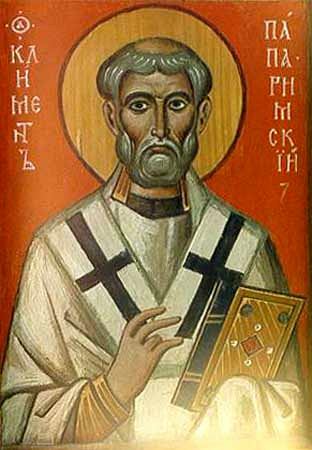 But how about St. Clement? Few of us know this saint very well: he was an early bishop of the Church in Rome, is said to have been installed by St. Peter himself, and has been sometimes associated with the Clement mentioned by St. Paul in Philippians 4:3 as a “fellow worker” for “the cause of the Gospel.” Even if we have heard of him, few of us realize that some of what he wrote has come down to us today. Subsequently, we do not realize that his epistle to the Corinthian church (written a few decades after St. Paul’s letters to the same congregation) was considered so important by some parts of the early Church that they counted it Scripture. The canon, of course, is closed today, and St. Clement’s letter didn’t make the cut. But that doesn’t mean there aren’t things we can learn from this associate of St. Peter and St. Paul—this early teacher of the Christian Church. You’d think, with credentials like that, Christians today would be lining up to hear what he had to say. And yet that’s not the case. We might run out to buy the latest book by Rob Bell, but somehow dead old authors like St. Clement and the other Church Fathers are almost entirely forgotten. 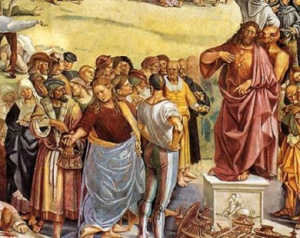 It is oft noted that Christians today have little sense of the Church’s history. This criticism is most frequently levelled against Evangelicals. And, indeed, many of us do hold a rather shallow history of the Church in our heads. It goes something like this (from the New Testament on): Jesus came. Then St. Paul sent some letters and visited a bunch of places. Finally, St. John wrote the Book of Revelation. Then, sometime around 1950, Billy Graham started preaching. Of course, Lutherans and members of the other old Protestant churches really don’t fare much better. Sure, some of us can name St. Augustine (though most of us haven’t really read much, if anything, by him). And then in the 1400s Martin Luther showed up. And John Calvin. And John Wesley. And a few other guys. But even if we could name great Christian thinkers from the Reformation on, we’d still have some pretty significant gaps in our knowledge. There’s the two to three-hundred year gap between the Apostles and Augustine, and then a thousand-year gap between Augustine and Luther. The fact is, most of us just don’t know that much of the Church’s history. And we’re especially lacking in our knowledge of the early history of the Church—the era of the “Church Fathers,” those Christian thinkers from just after the time of the Apostles who helped cement our understanding of such essential doctrines as the Trinity and the nature of Christ. All of this explains why I was delighted—and challenged—when my fiancée approached me recently asking whether we might join an online group planning to read through the Church Fathers. This group has broken down the voluminous works of the Fathers into easy reading of a few pages a day over several years. All the works are available for free online, so there’s no cost involved—except the cost of commitment. The group also plans to facilitate ongoing discussion of the readings on their website, creating a community to encourage and teach one another as we go through the Fathers’ writings. I’d like to challenge you to consider joining in, at least for a little while. At the very least, give the first book a shot. It’s St. Clement’s epistle to the Corinthians, and it will only take you three days to get through (reading just a few pages a day). Ever wondered what happened in the Church of Corinth after St. Paul wrote his letters? Here’s your chance to find out. The official start of the reading group’s plan for the Church Fathers is this Sunday, December 2, 2012. Check out the information at their website here. Note: Both my fiancée and her roommate mentioned this group to me, so I’m not entirely certain which one of them found it first. But I’m grateful to both of them for letting me know! The story illustrates a problem all too common in our time. Instead of seeking the God in whom our restless hearts find rest (à la Augustine), we accept the restless desires of our hearts and fashion gods as restless as we. We want peace, but we do not want peace as Christ gives it—a peace that passes our understanding and which divides father from son, mother from daughter. And so we elect leaders to preach an easy peace—peace where there is no true peace. We want reward, the promise of family, land, and possessions, but we do not want it “with persecutions,” as Christ offers it. We want rather the assurance that moth and flame will not destroy earthly treasure; and the prosperity preachers answer our call. We want joy and spiritual fervor, ecstasy and radical emotion; we do not want pain and suffering and dying to the self. We want miracles of power; we do not want water or bread and wine. We want glory; we do not want the cross. Read the rest over at A Christian Thing. The best Christian thinking has always placed a high value on the Arts, and the study of philosophy, literature, logic, history, languages, and the like. Such studies open our eyes to more fully understand the human condition. They teach us to critically approach the ideologies of our time, to hold counsel with those who have gone before us, to know and appreciate beauty, to understand the evil which has followed humankind throughout its long history, to live ethically, and to do so many other various and wonderful things. In short, the Arts provide us a framework for understanding the creation and our place in it. No wonder Martin Luther desired “that there be as many poets and rhetoricians as possible,” urging “young people to study poetry and rhetoric.” The reason is clear: “I see that by these studies, as by no other means,” he writes, “people are wonderfully fitted for grasping sacred truth and for handling it skillfully and effectively.” The Arts teach us how to think. And so we see Melanchthon is right to say the Arts’ demise would be sadder than the extinguishing of the sun; as the sun illuminates our world, so too the Arts illuminate our minds. Without them, we sit in darkness. You can understand, therefore, that I was disgusted when I learned yesterday that the University of Regina (my alma mater) is, in its great wisdom, driving the Faculty of Arts into the ground. In particular, the English department has faced numerous cuts over the past four years, and the word is out that they should prepare for even greater cuts in the future. Professors are retiring and no funds are being alloted to replace them. Whatever “fat” there was in the department was trimmed long ago, and now the department is being forced to consider cutting core classes to fit the budget. Things look bleak. Catch up on the story at the following links. And then, contact the UofR to let them know you disapprove of further, debilitating cuts to the Arts (especially English). I suggest sending your letter of discontent directly to President Vianne Timmons: The.President@uregina.ca. Note: Draw attention to the crisis with a Facebook-ready “cover image” of the “Realize: Reading and writing don’t matter” banner by clicking here. This past Sunday was the celebration for All Saints Day (actually Nov. 1), and the Sunday before that was (at least in my branch of the Christian Church) Reformation Sunday (actually Oct. 31). More often than not, these people are referring to Luther’s treatise On the Jews and their Lies. In this work, Luther writes some dreadful things, including his “sincere advice” to Christians to go and burn down the Jews’ synagogues and schools; destroy their houses; forbid their rabbis to teach under pain of death; deprive them of wealth and property; force young Jewish men and women into hard labour; or simply drive them out of the country. In the years leading up to World War II, the Nazis would rediscover this book of Luther’s and use it in their twisted campaign to first imprison and then murder the Jewish people. Now there are a whole host of defenses one could fall back on to try to excuse Luther for this book. One could argue that he was simply a product of his times. Antisemitism was prevalent in most of Europe during the Middle Ages, after all, and Luther was merely writing as many thinkers of his age did. 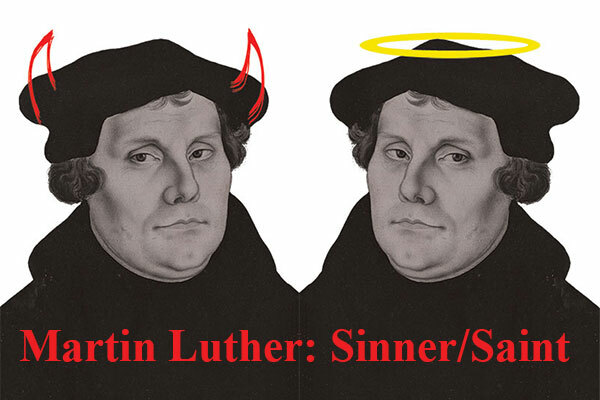 Or one could point out that Luther’s book was precipitated by the publication of a Jewish tract which (apparently) aimed to convert Christians to Judaism; Luther was no doubt writing in anger rather than reasoned thought. One could even point out that Luther’s earlier writings on the Jews were generally counsels to love them, not persecute them. Yes, one could do all these things when confronted by people disgusted with Luther and what he wrote. But I suggest there is a better approach to take. We should agree with them. Read the rest of the article over at CanadianLutheran.ca. Captain Thin is powered by	WordPress 5.0.4 and delivered to you in 0.499 seconds using 37 queries.